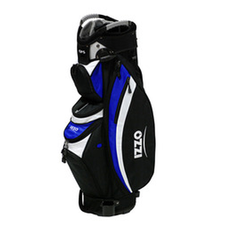 IZZO Golf Blue Locker Cart Bag- (Full Length Dividers) - $99.95 - GolfersEdgeOnline.com - Best Golf Equipment On The Web! The LOCKER Cart Bag weighs in at only 5.2 lbs and features a unique dual EZ Grip top for easier loading/unloading, and a 14-way top with full-length dividers – including an external putter well – for maximum accessibility. The LOCKER offers plenty of storage via 8 pockets. Including a full-length apparel pocket, multiple valuables pockets and an oversized insulated cooler pocket that can hold up to fifteen 12-oz cans! Other features include a universal GPS holder, a unique towel/ball line ring, velcro “glovekeeper”, pen holder, and umbrella tie. This is a classic cart bag compatible with both push and riding carts. If you have any more questions about the IZZO Golf Blue Locker Cart Bag- (Full Length Dividers); do not see the model you are looking for; need custom options; or prefer to not purchase online, then please call us at (630) 656-1291.